Craving a meal at 2 am? If hunger calls, but fast food is not going to cut it, drive to any of these favorite late-night eateries in Miami and the suburbs. Conveniently located in the heart of Brickell’s nightlife scene, La Moon serves deliciously crunchy arepas, salchipapas, and other Colombian finger food. On any night, you can spot a clan of drunken twenty-somethings binge-eating on burgers after a wild night dancing to ’90s music at Blackbird Ordinary—the lounge right next door. In case you’re driving home to the suburbs after a party in the city, Los Perros is a perfect spot to make a pit stop for a hot dog—zero judgments given. The casual joint is open after hours, serving Colombian-style hot dogs loaded with crushed potato chips, cheese, and pineapple sauce. The ingredients piled on together may sound a little off, but they magically repair your liquor-filled liver. Aside from locations in Kendall, Coral Way, Flagler, and Miami Lakes, they also have two places smack dab in the heart of Miami Beach—and they offer take-out. 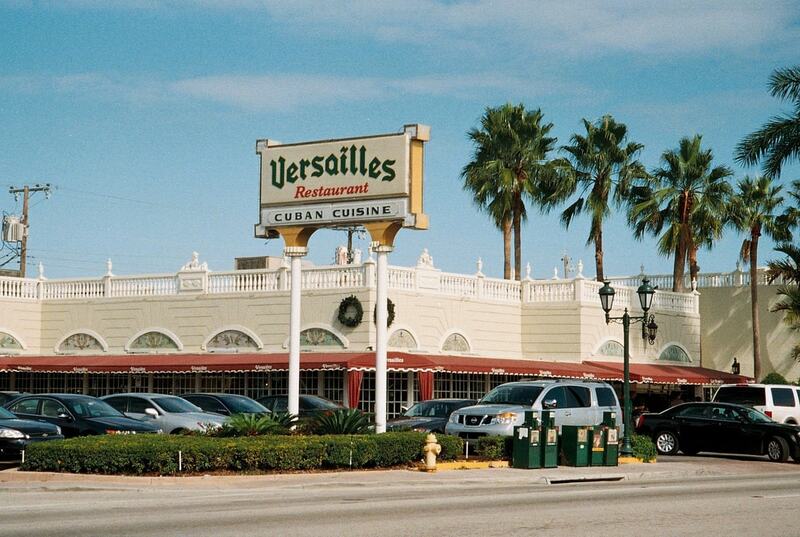 It doesn’t matter how much of a hot mess you are when you show up at Versailles—there’s always a plate of morros, yucca frita, or a cafecito at your service. The Cuban restaurant and its friendly servers sweetly offer you a lengthy menu with deliciously filling snacks, hearty meals, and strong coffee to jolt you out of your hazy slumber. This spot is the place to recuperate and recount all the events of the night. This sprawling restaurant, which serves up American classics on neon pink tables, sits on Collins Avenue, making it the perfect go-to hangout after a night of partying at STORY, Ora or LIV. Bite into their juicy “Big Pink Burger” or dig into a plate of baked mac and cheese. You can ask for a plate of pancakes at 3 am because there’s breakfast anytime. In the mood for a healthy sandwich? The French sandwich shop stuffs your choice of ham, cheese, and veggies in a toasted baguette or croissant so that you can settle your growling guts nutritiously. This little hole in the wall in the heart of Little Havana caters to your cravings Monday through Thursday from 3 pm to 3 am, and Friday through Sunday from 3 pm to 5 am because people crave tacos even when it’s not taco Tuesday. Come in for an order of steak tacos, burritos with rice, beans and cheese, fajitas, and a margarita. Ideally located on Ocean Drive in South Beach, Voodoo is open every night until 5 am. The menu varies from sushi to pizza to grilled kebabs and burgers. Did we mention it’s also a hookah bar with a rooftop view of the beach? In case you’re still aching for a good time in the wee hours of the morning, stop by here for a round of cocktails, hookah, and wholesome food.